There is something incredibly satisfying about making something from scratch. Especially something like Peanut Butter which is a store cupboard staple for most people in the Western World. Now I have a confession to make…I don’t actually eat Peanut Butter! But it’s one of Jon’s favourites so I wanted to have a go at making it at home. I’m mesmerized by the idea that a hard nut can become this glossy spreadable butter, so I decided that I could have a play, and get all food science-y, and Jon could enjoy the result at the end! If you’re a peanut butter lover then I guarantee, once you make this peanut butter at home you won’t want to buy store bought ever again! It’s so easy to adjust the levels or honey or salt to make it more sweet or savoury as you desire. You can also add chocolate chips or chopped peanuts if you prefer crunchy peanut butter. the possibilities are endless! Using different nuts, or a mixture of nuts (e.g. almonds) for a different nutty flavour. Homemade peanut butter is quick and easy to and there are none of the nasty preservatives found in some store bought jars! Place the peanuts, salt and honey into your food processor. Blitz the ingredients on a high speed until they begin forming crumbs. You will need to periodically scrape the mix down from the sides of the bowl. Keep processing the nuts as they change from being a breadcrumb texture, to a thick paste. Begin slowly drizzling the oil into the mix until it becomes a glossy spread. Transfer into a sterilised jar. While developing the recipe I often found myself Googling tips for making peanut butter. As with almost all cooking there is science behind it and it’s important to understand. Most recipes I came across asked you to blindly accept the proposition that the dry roasted nuts you’d popped into your blended with minimal liquid, would become a thick glossy spread. After 5-10mins of blitzing in the food processor, this hadn’t happened for me. The key thing to remember is that not all food processors are the same. Many of the professional bloggers are using high powered Vitamixes and other fancy food processors. If, like me, you don’t have one of these in your kitchen you will have to be patient! 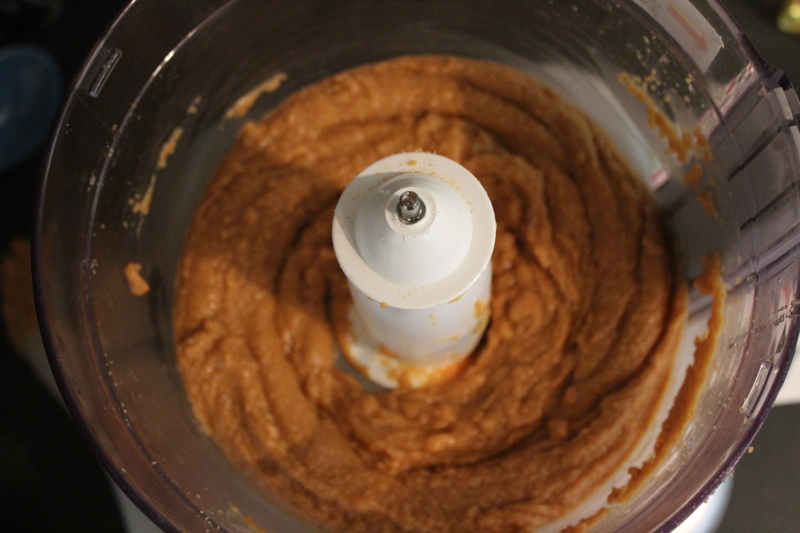 With my Kenwood Multipro, it took a good ten minutes (maybe more) before it got any where close to being spreadable. But I promise you it is worth the wait. There’s something magical about that moment when the nuts begin releasing their own oils and the mix suddenly becomes smooth and more liquid. Adding more oil will have very little impact until you are at the stage that you have a smooth paste/spread. Until this time, the oil will simply sit on top of the ground peanuts. Once the oil does break out of the nuts it will then be swimming in oil and be very unpleasant. Resist the temptation to add more oil! I’m also reliably told that Spanish peanuts have a higher oil content. If using these drop the oil in the recipe down to just 2 tablespoons. 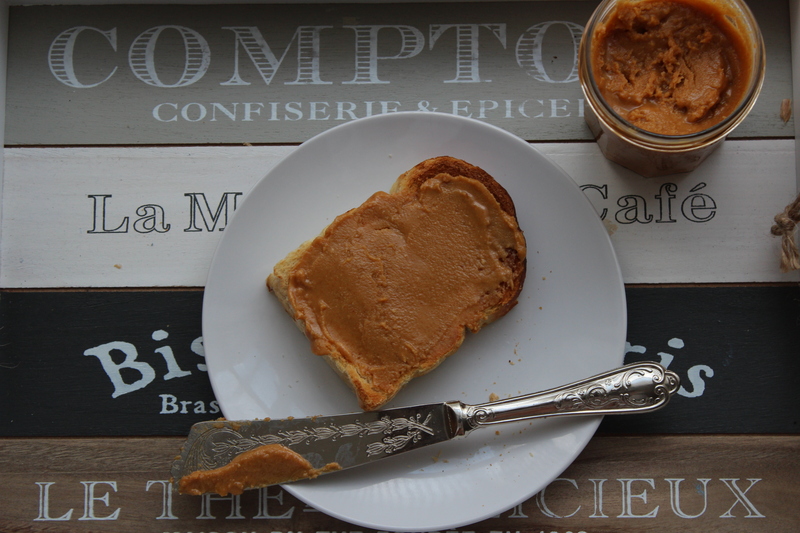 Once you’ve had a go at making peanut butter a few times you’ll begin to see what all the fuss is about. The jars last for a month in the fridge and are great as presents! I’m already trying to think how I can jazz up the jars for Peanut Butter with a Christmas Twist! 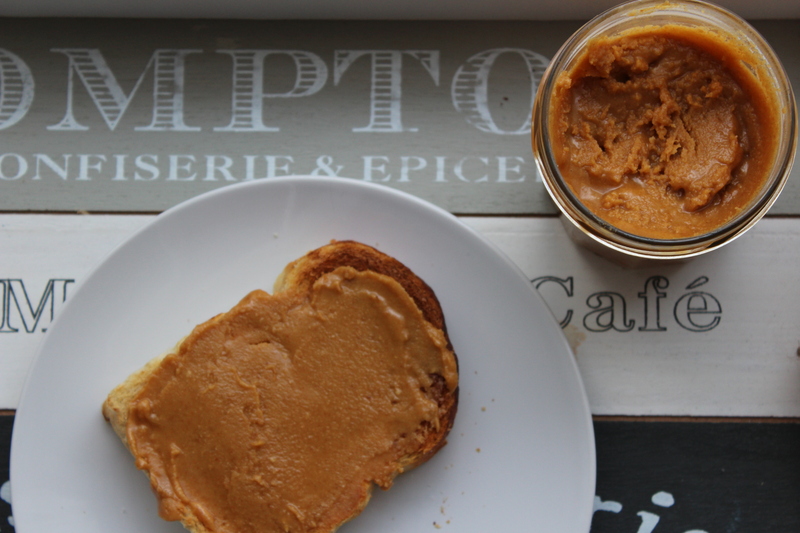 Have you ever tried making nut butter at home?